The time has almost arrived to usher in a new quarter at Bellevue College Continuing Education. With a handful of classes left in the current fall quarter, there are still quite a few options available for those just-in-time learners looking to quickly pick up some new skills. 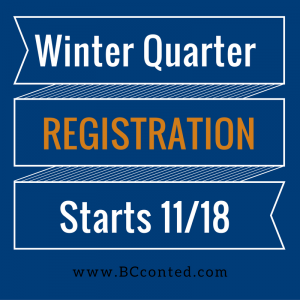 Looking ahead, we are excited to announce the start of Winter Quarter 2017 online registration this Friday, November 18. Look out for new classes, additional sessions of classes you might have missed, and a new set of original articles featuring students stories, instructor highlights, success tips, and more. With the end of the year approaching, it’s a great time to start planning your goals for 2017. Whether you want to develop your skills for career enhancement or explore a new hobby, we have classes to fit your needs. Join us for a relaxing art class taught by one of our exceptionally talented instructors from Art & Design programs. Take a language class with a family member or friend during the gloomy months of winter from one of our World Languages instructors. Get your skills up-to-date with the latest technologies in Business and Desktop Applications from Computer and Technology programs. The options are endless, all you need to do is #ImagineThePossibilities! Don’t forget to be the first to see what’s new for Winter Quarter 2017 this Friday in the online course catalog. Have questions about a class or registering, call our Customer Service team at (425) 564-2263 for assistance. We look forward to seeing you this winter quarter at North Campus!